Here’s what you can do to try and project yourself from bike thieves and what you can do in the event of a theft. Here’s an update on where things stand with my friend Justin’s stolen track bike. We’ve lined up the assistance of Portland Police Officer Joe Santos, who’s also a cyclist, by way of introductions made via of Kenji Sugahara and Lyne Lamoureux. Jens Voigt’s Army saw the bike yesterday afternoon: “FYI, one of my teammates spotted the bike @ Saraveza in North PDX. Went to get a lock to keep it there but it was gone.” So we know it’s still in the area and the buyer is perhaps unaware that it’s stolen. If you do see this bike on the streets, be sure to explain to the individual that the bike is stolen and that there are dual police reports filed in San Francisco and Portland. Thanks to Jonathan Maus of Bike Portland and everyone else who has been spreading the word for us. Justin is super appreciative of your efforts and can’t thank you enough. And lastly, if the original seller who posted the track bike on craigslist is reading this, you’re a real jerk for not replying to Justin’s emails. We hope you look forward to cooperating with the police. Dear Portland: Let’s Find This Stolen Bike! 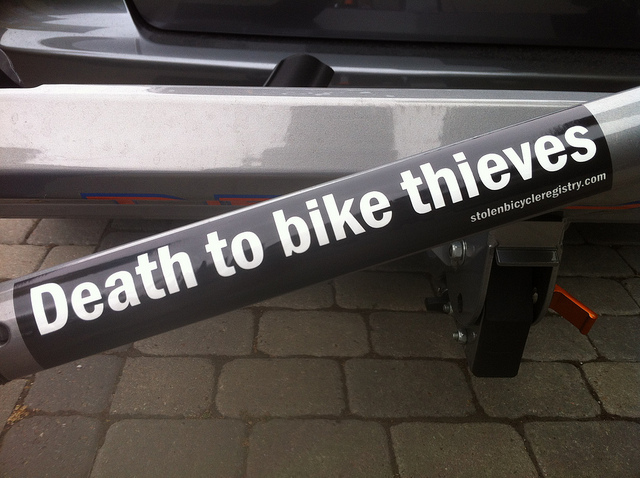 Bike thieves – they are the scourge of the cycling community. I recently had my mountain bike stolen, but it was miraculously recovered in just four days. Putting the word out online really helped with its return, and I’m hoping we can do the same for my friend Justin. I asked him to email me the story about his missing bike and why it’s so important to him. We can all assign a monetary value to our bicycles, but as you know, its real value isn’t about its price tag. “Here’s the story of my favorite bike ever. A 1980’s De Rosa Super Prestige pista. I purchased the bike from a gentleman on eBay in February of 2005. It was impeccable. Brand new. Mint. Not sure if the guy ever rode it. I took photos of the unopened box after the UPS man delivered it. Then I took photos of me opening the box, and pulling the frame out. I had never been so enamored with a bike. I was in bike love. All those years of staring at old De Rosa catalogs on the bulgier.net website, and now I had one, a perfect one. Not only was it a De Rosa, it also had an ornate decal celebrating a variety of Eddy Merckx’s victories on the top tube. “Incredible”, I thought. The bike was outfitted with Campagnolo’s C-Record pista group and Cinelli bars and stem. It was 100% Italian. I rode it at Hellyer, I rode it around SF, I rode it everywhere. I frantically called friends, posted on message boards, put up fliers, talked to messengers, filed a police report, complained to Public Storage, posted on craigslist, etc. I was optimistic I’d find it. I thought there was no way a bike of that caliber could stay hidden for that long. I setup an RSS feed to notify me anytime something with the word De Rosa was posted to craigslist. I did the same thing on eBay. I did everything. It never showed up though. It was gone. We’ve already started to put the word out in the Portland cycling community. Several friends of ours who live in Portland have already alerted their colleagues, co-workers and the media. But we also need your help getting this bike back! Share this post, be on the lookout wherever you go — bike shops, flea markets — and online. The De Rosa couldn’t have strayed too far as it was just sold last night via craigslist. We hope with your help that Justin might finally be reunited with his beloved bike.